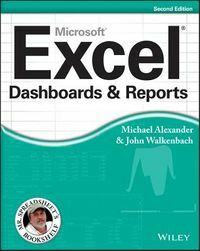 Take your Excel programming skills to the next level To take Excel to the next level, you need to understand and implement the power of Visual Basic for Applications (VBA). 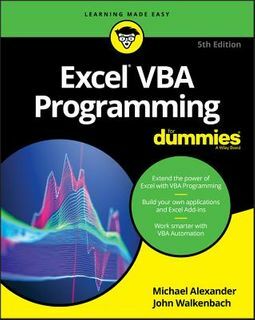 Excel VBA Programming For Dummies introduces you to a wide array of new Excel options, beginning with the most important tools and operations for the Visual Basic Editor. Inside, you'll find an overview of the essential elements and concepts for programming with Excel. In no time, you'll discover techniques for handling errors and exterminating bugs, working with range objects and controlling program flow, and much more. With friendly advice on the easiest ways to develop custom dialog boxes, toolbars, and menus, readers will be creating Excel applications custom fit to their unique needs! Fully updated for the new Excel 2019 Step-by-step instructions for creating VBA macros to maximize productivity Guidance on customizing your applications so they work the way you want All sample programs, VBA code, and worksheets are available at dummies.com Beginning VBA programmers rejoice! 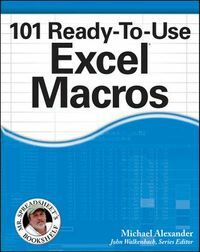 This easy-to-follow book makes it easier than ever to excel at Excel VBA!